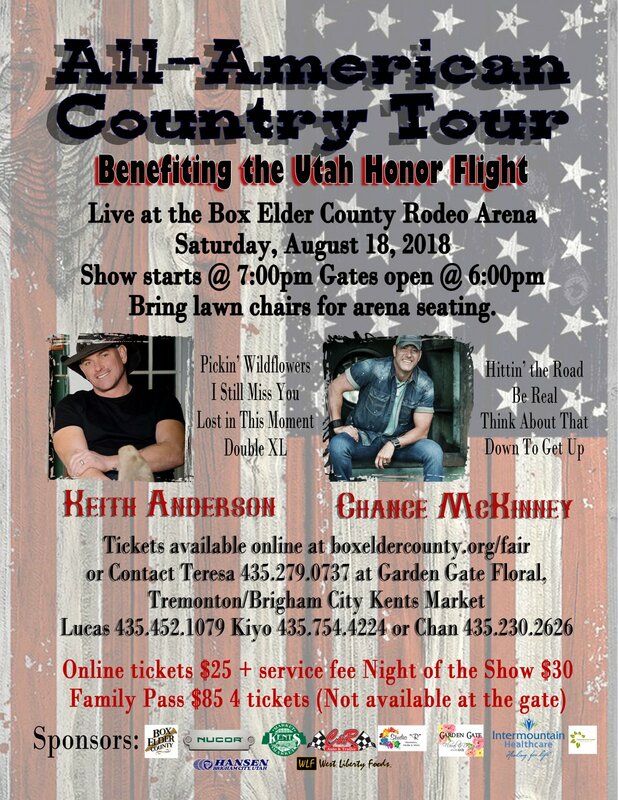 The fun begins at the Box Elder County Fair on Saturday August 17, 2019 with the Concert TBD benefiting the Utah Honor Flight with TBD . There are exhibit booths of the best down home crafts, food, artwork, photography flowers, fruits and vegetables. Wander through the small animal building to see rabbits, chickens and other exhibited animals. The kids will love it. The youth 4H and FFA livestock exhibit is one of the largest, if not the largest in the state, and there are activities going on all day long, every day. Performing groups entertain at the centrally located bandstand every afternoon and evening, and the best part is it is free. There is no admission charged to attend the fair. If you want to spend money there are business booths, craft booths, carnival rides, food stands, and a rodeo until 11 pm each night. Horse Show Speed Events..............................4:30 p.m.
Fine Arts.............................................................. 1 - 8 p.m. Photography........................................................ 1 - 8 p.m.
Poultry, Pigeons & Rabbits (Open, 4-H).............1 – 8 p.m.
Home Arts & Crafts (Tuesday Only)...............1 – 8 p.m.
Crops & Garden - Open, 4-H, FFA..................1 - 8 p.m.
4-H Indoor Exhibit.................................................1– 8 p.m.
Agriculture Mechanics............................................1 - 8 p.m.
4-H/FFA Beef Weigh-in....................................5 - 7 p.m.
4-H/FFA Beef Heifer Weigh-in........................ 5 - 7 p.m.
4-H/FFA First Sheep Weigh-in..........................5 - 7 p.m. DRAFT or HEAVY HORSE EVENTS (outdoor arena)......All Day . Baled Hay Contest.............................................. 6 – 8 p.m.
Floriculture (Prefer Entries Wednesday)........... 6 – 8 p.m.
Crops & Garden – Open, 4-H, FFA................... 7 – 8:30 a.m.
Baled Hay Contest................................... 9:30 – 11:30 a.m.
4-H/FFA Hogs............................................. 6 – 9 a.m.
4-H/FFA Second Sheep Weigh-in............... 9 –10 a.m.
Bucket Calves............................................. 3:30 – 4 p.m.
4-H/FFA Dairy Heifer Project........ ........... 4 – 5 p.m.
4-H Rabbit Show............................................. 8:30 a.m.
Open Class Rabbit, Open & 4-H Poultry, Pigeon......9 a.m.
Home Arts & Crafts, Floriculture..........................9 a.m.
BULLS, STOCK SADDLE BRONCS & BARRELS........8 p.m.
Home Arts Exhibit Building Open.......................... 6 p.m.– 10:30 p.m.
Crops and Garden Exhibits Open........................ 6 p.m.– 10:30 p.m.
4-H/FFA Swine Market Show............................................ 7:30 a.m.
4-H/FFA Sheep Market Show.............................................8:30 a.m.
Home Arts Exhibit Building Open....................................................... 10 a.m. – 10:30 p.m.
Crops and Garden Exhibits Open...................................................... 10 a.m. – 10:30 p.m.
Commercial Exhibits Open................................................................. 11 a.m. – 11:00 p.m.
4-H/FFA Beef Market Show.......................................... 1 p.m. Vegetable Judging Contest............................................... 3– 5 p.m.
Bucket Calf Show...........................................l............ 5 p.m. Junior Livestock Judging Contest....................................... 5:30 p.m. Horse Show Judged Events.............................................. 8:00 a.m. Beef Fitting & Showmanship.........................................9 a.m.
Sheep Showmanship Contest...................................... 9 a.m.
Home Arts Exhibit Open.................................................................... 10 a.m. – 10:30 p.m.
Crops and Garden Exhibits Open........................................................ 10 a.m. – 10:30 p.m.
Commercial Exhibits Open.............................................................. 11 a.m. – 11 p.m.
Pre-Rodeo Performance: .................................................... 6:45 p.m. Parade of Champions.......................................................... 7:45 p.m.
Rodeo (TETWP Night)................................................... 8 p.m.
2 Mile Walk.......................................................................... 7:15 a.m. Junior Livestock Sale (Hogs,Lambs, Steers)........................... 8:45 a.m.
Home Arts Exhibit Building Open................................................................ 10:00 a.m. – 10:30 p.m.
Crops and Garden Exhibits Open.................................................................. 10:00 a.m. – 10:30 p.m.
Commercial Exhibits Open.......................................................................... 11:00 a.m. – 11:00 p.m. Antique Tractor Pull (Small outdoor arena)..........................2:00 p.m.
Pre-Rodeo Performance: .......................................................... 6:45 p.m.
Rodeo (Patriot Night)........................................................... 8 p.m.
Exhibits Must Be Picked UP between.................................................. 9:30 – 10:30 p.m. Premium money may be picked up on Friday beginning at 2 p.m. - 10 p.m. and on Saturday from noon - 10 p.m. No pets are allowed in the indoor exhibit buildings except for service dogs.